In more than 40 years as a journalist what follows may well be my favourite story. I loved researching it and I really enjoyed writing it. I post it here every Remembrance Day. . . . This is the story of Lyman (Hick) Abbott, a fine, young athlete who lost his life in the First World War. Edward Lyman Abbott was, they all agreed, one of a kind. He was a superb athlete and, just as important, he was a true sportsman. Everyone in southern Saskatchewan knew Abbott as Hick, which was shortened from Hickory, and he was loved by young and old alike. In the early part of the 20th century, Hick Abbott was the best athlete in Regina and maybe all of Western Canada. To this day, it may be Abbott who is the best athlete Regina has seen. As we pause at the 11th hour of the 11th day of the 11th month, his story is but one of many worth remembering. This, then, is that story. Or, at least part of it. The gentlemen of Regina’s sporting scene would gather at Joe Potts’ Rose Athletic Parlours on the east side of the 1700 block Rose Street. They would go there for a shave, maybe a trim and, most definitely, to talk about how their sporting world turned. The Rose Athletic Parlours – the name was in honour of a Potts penpal, Philadelphia Athletics manager Connie Mack – was a seven-chair operation, with each barber having his own washbasin and mirror. There were two other huge mirrors – floor to ceiling – and a circular leather seat that surrounded a pole on which was beautiful leather backing. A long glass counter was home to a gold-coloured cash register and boxes of chocolate bars. Mahogany-veered cabinets behind the counter were full of tobacco products. And there were photographs – they didn’t call them pictures then – everywhere. Photographs of prominent athletes. Many of them autographed. The billiard room was separate and featured Boston tables, although there was one billiard table. Each table had its own mahogany cabinet in which players hung their hats and coats. This is where doctors, dentists, lawyers and businessmen came. This is where they talked about the exploits of their favorite son. Hick Abbott was of fair complexion. He had gray eyes that, in a blink, would steal a young girl’s heart. And that hair. Oh, that light brown hair that always had that naturally tousled look. Born in Orillia, Ont., in the Hovering parish, on May 1, 1891, Abbott, who was of the Methodist faith, moved to Regina for some reason long since lost. His father, James Henry Abbott, lived his last days in Toronto. In a file folder full of documents, notes, papers and photographs, there isn't a mention of a mother. Perhaps Hick Abbott’s mother died and he moved to Regina to live with his sister, Robena Myrtle, who was a provincial government employee. A brother, Samuel Percival Abbott, lived near White Bear, Sask. Hick Abbott played football (rugby football, it was frequently called then), hockey, baseball, lacrosse, soccer, basketball. He excelled at them all. He played in high school. He played for club teams. He played on playgrounds or in a gymnasium. It didn’t matter. He just wanted to play. He had to play. But hockey was his game. He was a right winger who played for as many teams as he could. He played for the Regina Bees Capital Hockey Club, which won the Valkenburg Cup as the province’s 1911-12 amateur champions. But there was trouble in Europe where, before long, the First World War would be raging. Soon, newspapers were full of casualty reports. Regina’s sons were dying over there. Naturally, Abbott heard the call, as did many of his teammates from that 1913-14 team, including goaltender Fred McCulloch, defencemen Charlie Otton and Austin Creswell, who was the team captain, and rover Freddy Wilson. Abbott took officer training in Winnipeg, qualifying for the rank of lieutenant. He returned to Regina and enlisted with the 68th Battalion. On the day Abbott enlisted – Sept. 23, 1915 – he was a 24-year-old student at law who lived in Regina at 2254 Rose St. Seven months later, on April 28, he was on the S.S. Olympic as it sailed from Halifax. Abbott headed overseas as a platoon commander and officer in charge of records. Abbott was a true warrior. Whether it was on the field of play or on the field of war, there wasn’t any quit in this man. 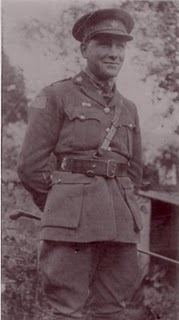 Upon his arrival in England, he quickly transferred to the 52nd Canadian Infantry Battalion, a trench unit. In the ensuing 26 months, shrapnel was the only thing that kept him from the front. He was first injured on Oct. 7, 1916, while in action near Courcelette, about 30 miles northeast of Amiens, in what came to be known as the Battles of the Somme. Four days later, Abbott was admitted to No. 14 General Hospital at Boulogne with a wound to his left shoulder. Two days later, he was in England, safely ensconced in a war hospital in Reading, a few miles west of London. A doctor noted a “shrapnel bullet localized near wound.” That shrapnel was removed on Oct. 24; he was discharged from hospital on Nov. 13. Abbott rushed back to the front and stayed until June 3, 1917, when he was granted 10 days leave, which he spent in Paris. Three months later, on Oct. 27, he was awarded a Bar to his Military Cross. The glasses were the result of his being wounded for a second time. He took a bullet – or a piece of shrapnel – in the right temple on Sept. 4, 1917, while raiding enemy trenches near Leuze, just over the border from France in the southwest part of Belgium. By Sept. 15, he had been “invalided, wounded and detached” to the Manitoba Regimental Depot and was being cared for in the 3rd London General Hospital in Wandsworth. A doctor's report noted: “Recommended for convalesence . . . to report back in three weeks.” Abbott was discharged on Sept. 24, 1917, and spent the next month at St. Mark's College, leaving there on Oct. 25, 1917. The next entry in his medical record is dated Sept. 14, 1918. It is short and to the point: K. in A. It was Aug. 8, 1918. It was the day on which the Battle of Amiens began. It was the battle in which Hick Abbott died. After recovering from his head wound, Abbott returned to France on Dec. 24, 1917. A week later, he was back with his unit. With Capt. G.M. Thomson heading for England, application was made for Abbott to be an acting captain with the 52nd Battalion. That was approved on March 16, 1918. Abbott, then, was a captain when the Battle of Amiens, one of the war’s most decisive battles, began. The German’s spring offensive had been stopped only eight miles from Amiens. Now it was time to push them back. Later, after the Armistice had been signed on Nov. 11, 1918, it was generally acknowledged that this was where the tide had turned. In two weeks, 46 German divisions were defeated – 34,250 prisoners and 270 heavy guns were captured. On Aug. 14, with the battle almost won, Abbott – always the leader – was first out of a trench as he led a charge towards the enemy. According to Earl Longworthy, an acquaintance of Abbott’s, he was killed by a sniper’s bullet to the head. By the time of his death on Aug. 14, 1918, Abbott’s father also was dead. Hick’s medals went to his sister, Robena, who was living in Regina at 2072 Angus St. A plaque and scroll went to his brother, Samuel, at White Bear. Abbott’s will, dated July 1, 1916, indicated that there may have been another woman – besides his sister – in his life. “The world of sport of Regina, and for that matter the entire province of Saskatchewan, is the poorer today by the loss of Hick Abbott. “As long as Regina is, the name of Abbott will live. To the present generation his name stands supreme as a monument to the best that was in sport. To the future generation he has left an ideal for them to attain. “The citizens of Saskatchewan have lost one of nature’s gentlemen, one who held dear the traditions of his land and one who ever had at heart one thing – the interest of his fellows. “A hero among his fellows he was equally loved by the boys. No business was ever too pressing to prevent him claiming their comradeship. To the younger lads of Regina his life and glorious death will be an inspiration. Potts, who had named his first-born son after Abbott – J. Lyman Potts, born on Nov. 11, 1916, is retired and living in Burlington, Ont. – would make certain that Hick wouldn’t be forgotten. 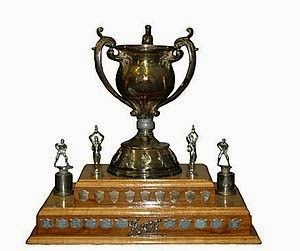 Late in 1918, Joe Potts started a fund-raising drive, the result of which would be the Abbott Memorial Cup, which for years would go annually to the champion of western Canadian junior hockey. When the subscription drive started, the first name on the list was Lyman Potts ($10). The second name was that of Lieut. Austin Creswell, the captain of the 1914 Victorias. Irvin was a 21-year-old centre on the Winnipeg Monarchs team that lost the 1914 Allan Cup final to the Vics. Almost 80 years later, the Abbott Memorial Cup no longer could be considered a prominent trophy. Where it once went to the winner of a best-of-seven series, in its last years it was presented to the winner of one round-robin game between two western representatives during the Royal Bank Cup. “I know absolutely nothing about the Abbott Cup,” admitted one member of the Melfort Mustangs, Abbott Cup winners for 1996. “It’s just an appetizer (for the Royal Bank Cup),” added another player. It seems, alas, that Sid Smith’s worst fears were recognized. Hick Abbott, who left Regina to fight for his country’s freedom, never returned to his adopted home town. He is buried in Roye New British Cemetery, a few miles north of Paris.